Step 1. Heat the Non-stick Pan. Add Milk. Step 2. Cook on the medium heat till you get the first Boil. Step 3. Add Cream and Thandai Syrup, again cook on medium heat for 5-10 minutes. Step 4. Take 1/4 cup of Hot Milk Mixture (which you are cooking) in a bowl and add Corn Flour. Step 5. Mix Corn Flour properly to the milk mixture so that there is no lump present. Step 6. Add this Corn Flour Mixture to the heating Pan. Step 7. Again cook for 5 more minutes. You will see that your mixture is getting thicker in consistency. Step 8. Your Mixture is ready, keep it aside to cool down. Pro Tip - Once the mixture comes to the room temperature, Use a hand blender to whisk the mixture. This will make your mixture more smooth and creamy, plus it will make sure that there is no lump present. Step 9. 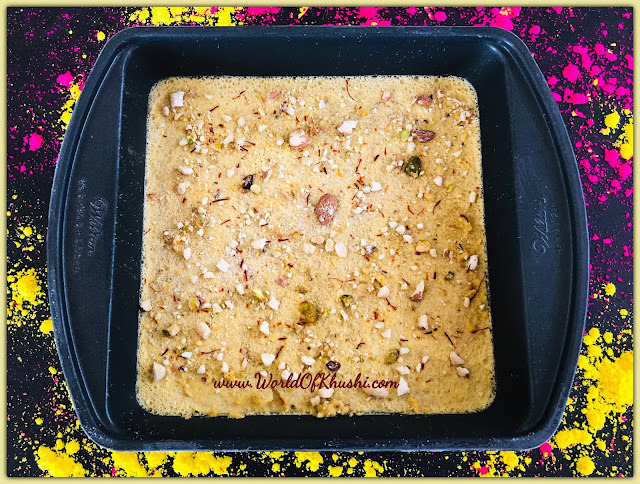 Pour the mixture into a freezer-proof container and pour some Crushed Dry-fruits on top of it. Step 10. Freeze the mixture overnight or for at least 6 hours on the coldest temperature. Your delicious Thandai Ice-cream is ready. Step 1. Remove the freezer-proof container form the freezer and keep it aside for 5 minutes so that you can easily scoop out the Ice-cream. Step 2. Add two to three scoops of Ice-cream in a deep bowl. Step 3. On top of it add lots of Tutty-Fruity, Crushed Dry-fruits, Saffron and Rose Syrup. Note - This time I am using Thandai Syrup but you can also use Thandai Masala. For knowing How to make your own Thandai Masala please click HERE. 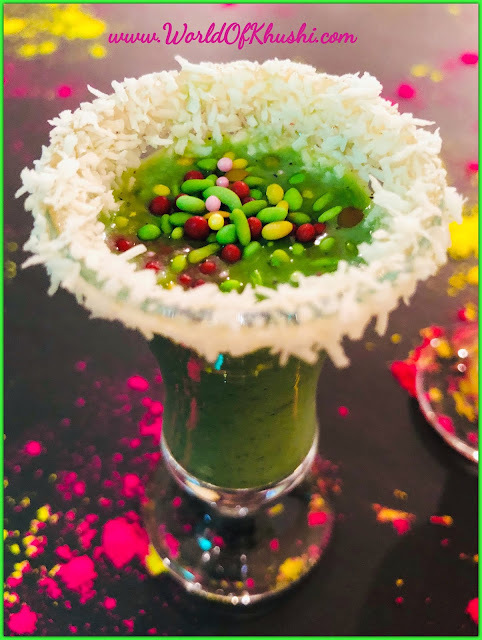 On a hot HOLI day, this Ice-cream is the perfect treat! In my family, it's a big HIT and I am very sure that your family and friends will love this Ice-cream too. 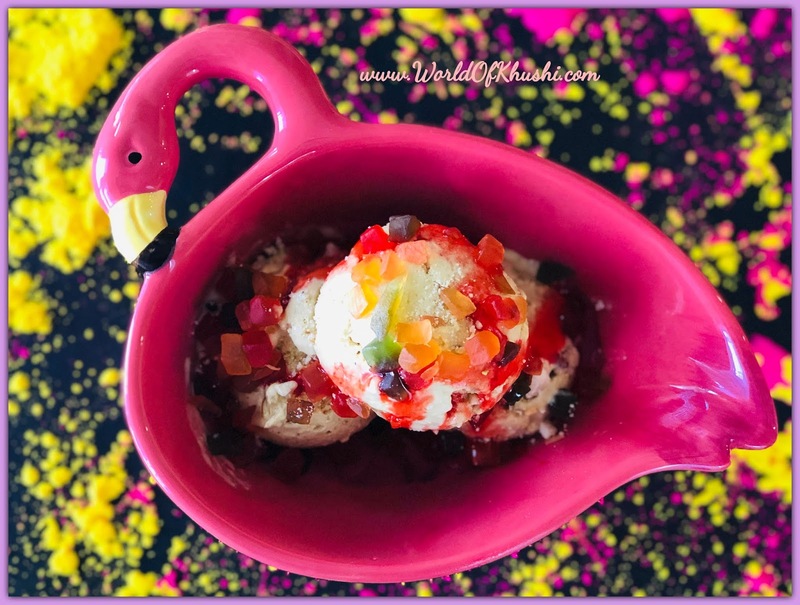 Enjoy this delicious Thandai Ice-cream on this festive season and please let me know your feedback! !